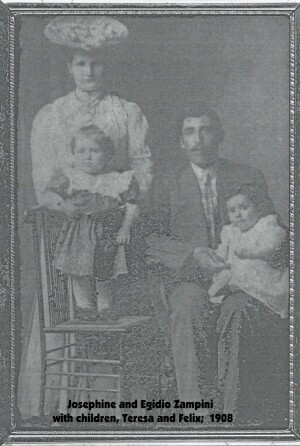 Maria Giuseppa DiIorio first appears in the Painesville, Ohio, area in 1904. In America, Maria Giuseppa DiIorio was known by her married name, Josephine Zampini. Maria Giuseppa DiIorio, daughter of Filippo DiIorio and Maria Filomena Vitolone, was born on November 12, 1887, at Frosolone, Italy. She married Egidio Zampini, son of Felice Zampini and Teresa Notte, on March 11, 1904. Maria died on December 1, 1952 at Lake County Memorial Hospital at Painesville, Lake County, Ohio, at age 65. Her body was interred at Saint Mary Catholic Cemetery at Painesville Township, Lake County, Ohio. Maria Giuseppa DiIorio immigrated to the United States on May 4, 1904, at age 16, travelling to Painesville, Lake County, Ohio. She was accompanied by her husband, Egidio Zampini, who was returning to Painesville, and Egidio’s sister, Domenica Zampini. Three of Josephine’s siblings also lived in Painesville, Ohio. 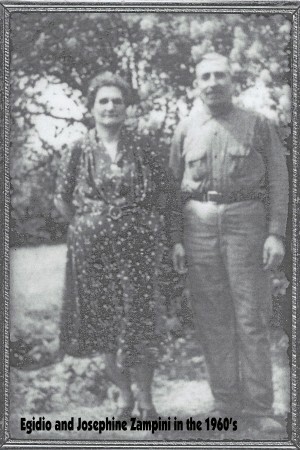 Her brother, Nicola DiIorio, immigrated to Painesville in 1908. Brother, Felice, immigrated in 1920. Sister, Maria Donata, immigrated in 1921. 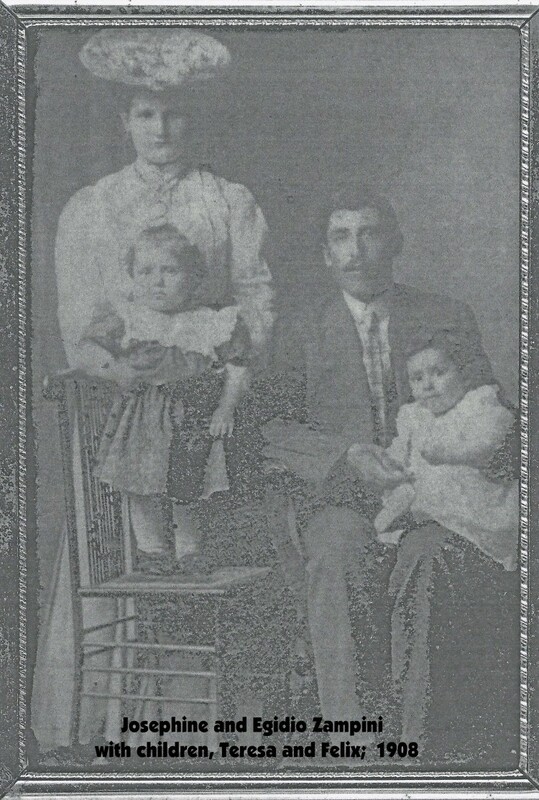 Josephine’s mother, Maria Filomena Vitolone, was a first cousin the Painesville Square’s mother, Maria Giovanna Vitolone. 1. 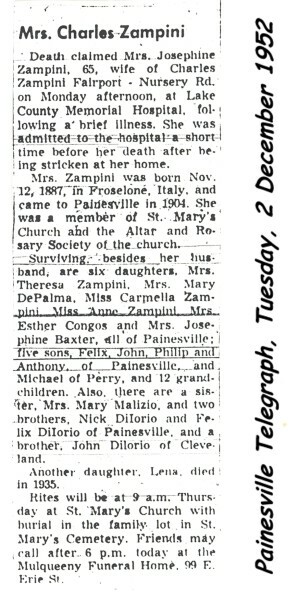 Mary Theresa Zampini was born on December 28, 1905, at Painesville Township, Lake County, Ohio. She married Augustino “Gus” Antonio Zampini, son of Orazio Zampini and Maddelina Padula, on April 10, 1928, at St. Mary Catholic Church at Painesville, Ohio. Teresa died on May 24, 1983 at Lake County Memorial Hospital at Painesville, Lake County, Ohio, at age 77. Her body was interred at Riverside Cemetery at Painesville, Lake County, Ohio. 2. Felix Zampini was born on November 21, 1906, at Painesville, Lake County, Ohio. He married Mary Elizabeth Sally, daughter of Vincent Sally and Anna Erdos. Felix died on May 24, 1986 at Perry Township, Lake County, Ohio, at age 79. His body was interred at Riverside Cemetery at Painesville, Lake County, Ohio. 3. Mary Zampini was born on September 8, 1908, at Painesville, Lake County, Ohio. She married Arcangelo DePalma, son of Luigi DePalma, on July 12, 1945 at Painesville, Lake County, Ohio. Mary died on April 14, 1995 at Homestead II Nursing Home at Painesville, Lake County, Ohio, at age 86. Her body was interred at Riverside Cemetery at Painesville, Lake County, Ohio. 4. John Zampini was born on May 31, 1910, at Painesville, Lake County, Ohio. He married first, Catherine Rose, daughter of Oscar and Amelia Rose. After the death of his first wife, he married second, Ann Mary Novak, daughter of Frank Novak and Julia Yuhasz. John died on June 17, 1967 at Lake County Memorial Hospital at Painesville, Lake County, Ohio, at age 57. His body was interred at Riverside Cemetery at Painesville, Lake County, Ohio. Ann Novak was the widow of Steve Spisak when she married John Zampini. 5. Lena Zampini was born on June 30, 1912, at Painesville, Lake County, Ohio. Lena died on January 16, 1935 at Lake County Memorial Hospital at Painesville, Lake County, Ohio, at age 22, of peritonitis after an appendectomy. Her body was interred at Saint Mary Catholic Cemetery at Painesville Township, Lake County, Ohio. 6. Carmella M. Zampini was born on March 17, 1914, at Painesville, Lake County, Ohio. Carmella died on January 13, 2004, at her home, Painesville, Lake County, Ohio, at age 89. Her body was interred at St. Mary Cemetery at Painesville Township, Lake County, Ohio. 7. Phillip Zampini was born on January 21, 1916, at Painesville, Lake County, Ohio. Phillip died on February 12, 1992 at Geneva Memorial Hospital at Geneva, Ashtabula County, Ohio, at age 76. His body was interred at Williams Cemetery at Leroy Township, Lake County, Ohio. 8. Michael Zampini was born on March 21, 1918, at Painesville Township, Lake County, Ohio. He married Ann Sabadosh. 9. Anne M. Zampini was born on July 21, 1920, at Ohio. Anne died on July 2, 1992 at Mt. Alverna Nursing Home at Parma, Cuyahoga Coounty, Ohio, at age 71. 10. Anthony George Zampini was born on February 22, 1923, at Ohio. He married Anne Regina Minniti, daughter of Paolo Minniti and Rosaria DiLeto, on June 25, 1949 at Harrison, West Virginia. Anthony died on September 26, 1968 at his home, 3064 Sheperd Road, at Perry, Lake County, Ohio, at age 45 of a heart attack. His body was interred at Perry Cemetery at Perry Township, Lake County, Ohio. 11. Esther M. Zampini was born on November 15, 1925, at Painesville, Lake County, Ohio. She married George R. Congos on July 5, 1947 at Painesville, Lake County, Ohio. Esther died on May 7, 2001 at her home at Osseo, Trempealeau County, Wisconsin, at age 75. Her body was interred at Holy Guardian Angels Cemetery at Brackett, Eau Claire County, Wisconsin. 12. 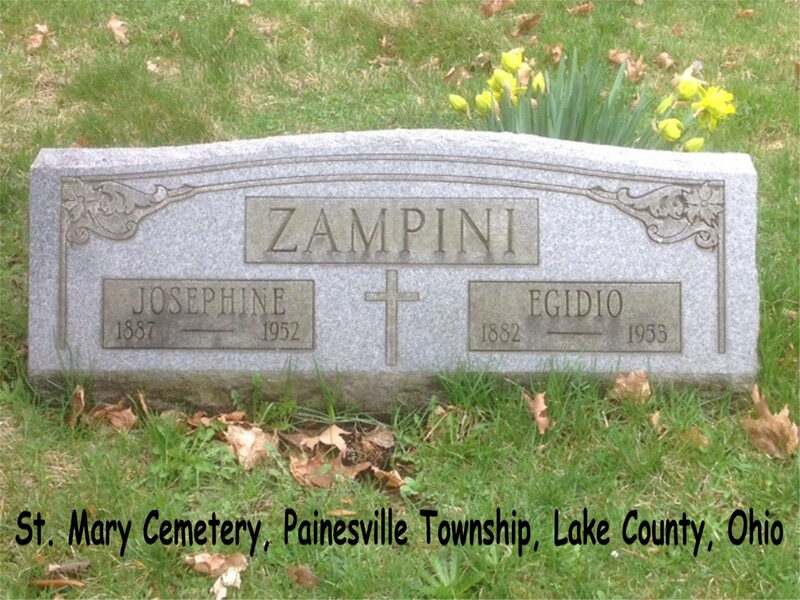 Josephine Zampini was born on July 10, 1928, at Painesville, Lake County, Ohio. She married William Baxter. Josephine died on September 6, 1992 at the Cleveland Clinic Hospital at Cleveland, Cuyahoga County, Ohio, at age 64. Her body was interred at Riverside Cemetery at Painesville, Lake County, Ohio.